With an extensive list of film credits, Ralph Macchio is best known for his celebrated performance as “Johnny” in Frances Ford Coppola’s, The Outsiders; the hit film My Cousin Vinny, costarring along with Joe Pesci and Marisa Tomei; and most notably for the title role in the popular classic, The Karate Kid and its successors The Karate Kid Part II and The Karate Kid Part III. Ralph reprises his iconic role of Daniel LaRusso in the critically acclaimed series Cobra Kai for Sony Pictures Television and YouTube Red. The 10-part first season was released on YouTube Red in May 2018, and the series was recently renewed for a second season slated for release in 2019. He also plays Officer Haddix in HBO’s hit series The Deuce, now in production on Season 2. The series returns to HBO in Fall 2018. Ralph was featured in the film Hitchcock, portraying “Psycho” screenwriter, Joseph Stefano, acting opposite Sir Anthony Hopkins and last year starred in the character-driven comedy, Lost Cat Corona. Previous feature-film highlights – Walter Hill’s Crossroads, Distant Thunder with John Lithgow, as well as the ensemble film, Naked in New York. Other films include, Teachers, with Nick Nolte; A Good Night To Die, Rosencrantz and Guildenstern Are Undead, Forever Together, Beer League, He's More Famous Than You, A Little Game and both Too Much Sun and Up The Academy with Robert Downey Jr.
Other Television credits include guest starring on two episodes of USA’s hit-series, Psych as well as Psych, The Movie. A special guest-star role on CBS’s hit-comedy, How I Met Your Mother. Before that, he had a two-season arc on ABC’s, Ugly Betty and a recurring role as Fran Drescher’s love interest on the hit TV Land sitcom, Happily Divorced. Other noteworthy TV credits include a popular turn on the hit HBO series, Entourage, as well as the Starz comedy, Headcase. Earlier in his career, Macchio received critical acclaim for the title role in the ABC television film, The Last Pow? The Bobby Garwood Story. Some other television movie credits include, The Three Wishes of Billy Grier for ABC, and Dangerous Company for CBS. His start in television came with a series regular role on ABC’S, Eight is Enough. In 2011, Macchio became an instant fan-favorite on Dancing with The Stars where he enjoyed a long successful run on the ABC Blockbuster competition show. His smash hit FUNNY OR DIE video entitled, Wax On, F*CK Off has been a viral sensation since its release; gathering raves from critics and viewers alike. 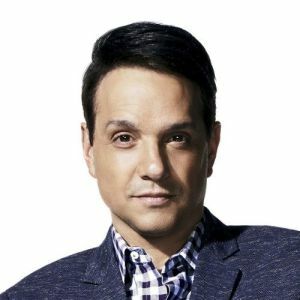 As a filmmaker/producer/writer, Macchio has written and directed a short film entitled Love Thy Brother, which premiered at the 2002 Sundance Film Festival and can now be seen on HBO and iTunes. He is Executive Producer of the TV Docu-Series for National Geographic Channel entitled, American Gypsies. His most recent film, Across Grace Alley of which he wrote and directed, has garnered high praise and is now available on Netflix. That film stars Marsha Mason and Karina Smirnoff. On the NY stage, Ralph made his Broadway debut starring opposite Robert DeNiro in the sold-out Joseph Papp production of Cuba and His Teddy Bear, at the Longacre Theatre. He received critical acclaim, starring in the National Tour of the Broadway musical-comedy revivalHow to Suceed in Business without Really Trying, directed by Des McAnuff. He originated the role of Calvin in the Off-Broadway production of Magic Hands Freddy Other theatre credits include the off-Broadway comedy, Only Kidding and the Abington Theatre Company production of A Room of My Own. He’s also the voice of Tim in the MGM animated feature, The Secret of Nimh II, in which he recorded two songs for the film that also appear on the soundtrack.